British Columbia’s Freedom of Information and Protection of Privacy Act (FIPPA) requires public bodies such as UBC to conduct a Privacy Impact Assessment (PIA) for all new or substantially modified systems, projects, programs, or activities (hereinafter referred to as “Projects”). A PIA is a risk management and compliance review process used to identify and address potential privacy and security issues, thus avoiding costly program, service, or process redesign and minimizing exposure to potential privacy or security breaches. Overall accountability for the PIA process required by FIPPA resides with the University Counsel, under whose guidance Risk Management Services (RMS) handles the PIA process. RMS has also developed a set of tools to support this process. As UBC engages in a vast array of projects, it follows a risk-based approach to PIAs, which is summarized below. Use the PIA Risk Classification Tool (RCT) to determine your project’s privacy and information security risk classification. Ensure your submission has as much detail as possible to maximize our understanding and ability to assist in risk identification and mitigation efforts. E-mail the completed RCT (irrespective of the results of the risk classification) to pia.process@ubc.ca for review by PIA team. A PIA reference number will be assigned to your submission, and an email acknowledging receipt of the submission or initial follow-up will be sent to you, normally within 2 to 4 business days. As Low and Medium Risk projects do not require a review by the PIA team, you are responsible for ensuring that you comply with privacy and security requirements. The privacy requirements are set out in UBC’s Privacy Fact Sheets. The security requirements are set out in UBC’s Information Security Standards. If you have questions about the application or interpretation of these documents, please do not hesitate to contact the PIA team at pia.process@ubc.ca. If there is a change in risk level, you are responsible for submitting an updated RCT form. High or Very High Risk projects must undergo a review by the PIA team to assess compliance with privacy and security requirements. Do not proceed until PIA staff have completed this review. PIA review could be either an accelerated or multi-step process, depending on various factors such as nature / complexity of the project, and risk classification. This process is used for low-complexity projects. Project teams should submit an RCT as early as possible during the planning phase of the project. The PIA team will apply an expedited process that is customized based on the complexity of the project and advise project teams on next steps. This process is used for complex projects such as large system implementations affecting multiple functional areas. It is divided into three phases, namely, Concept, Architecture & System Selection, and Implementation. The project teams are required to submit an updated RCT in each of these phases. The PIA team will be involved in the discussions throughout the project lifecycle and advise project team on next steps. For other important information in the PIA process, please refer to the Frequently Asked Questions below. What issues are addressed in a PIA? What is our legal authority to collect, use and disclose personal information? Is the collection, use, and disclosure of the particular personal information for a purpose that is consistent with the project as described? Is personal information stored, processed, and accessed within Canada? How is personal information protected from unauthorized use or disclosure? How long is the personal information retained? How much time and effort does a PIA take to complete? UBC’s risk-based approach to PIAs results in more extensive assessments of higher-risk projects to ensure key risks are identified and appropriate actions are taken. These higher-risk projects require the involvement of privacy and security staff who will review the PIA forms you submit and will provide guidance and assistance to help you address key privacy and security risks. Review of higher-risk projects can follow either a multi-step or an accelerated process. The multi-step process is used for complex projects and spans all of the project life-cycle phases (Concept, Architecture & System Selection, and Implementation). The accelerated process is for projects that are lower complexity. Any high-risk PIA that involves or results in data-linking between public bodies or agencies must also be reviewed with BC’s Office of the Information and Privacy Commissioner (BC OIPC). It is uncertain how long this review process will take, so you should allow plenty of time in these cases. Conversely, while low-risk projects still need to comply with all relevant UBC privacy and security standards (including Privacy Fact Sheets, the Information Security Standards, and the Key Security and Privacy Risks & What “Good” Looks Like document), there is no need for you to wait for an independent assessment by central privacy and security personnel. When do I have to start a PIA, using the Risk Classification Tool (RCT)? You must use the RCT if you are responsible for a new project or an existing project that is being substantially modified (a “Project” is any system, project, process, program or activity that supports University business). Start the PIA as early as possible in the project, as soon as the high-level objectives are understood. This helps to prevent substantial re-work and project delays. If factors in your project change, the RCT should be re-submitted. system access is being changed so that new categories or groups of individuals will have access to personal information; e.g. granting access to other units within the department, other departments or external parties. Note: this does not include day-to-day or routine operational changes to access due to personnel changes. What additional information do you require from project teams / vendors to complete the PIA review? Third-party attestation reports such as SOC reports, ISO 27001 etc. What additional documents or tools are used in the PIA review process? The PIA team utilizes various tools and documents as part of the PIA review process, depending on the project type and stage. Below is a visual representation of the tools/documents used. Visit the RMS website to download the most recent version of each. Can we share PIAs with other organizations? Are research projects treated differently? Yes. Generally speaking, a PIA is not required for academic research projects. However, there are certain circumstances when a security assessment may be required for tools that you may use to store and protect personal information during academic research. Please reach out to pia.process@ubc.ca for more information. What are the consequences of not doing a PIA? A PIA is a legal requirement of British Columbia’s Freedom of Information and Protection of Privacy Act (FIPPA) and not doing one results in non-compliance with legal and regulatory requirements. 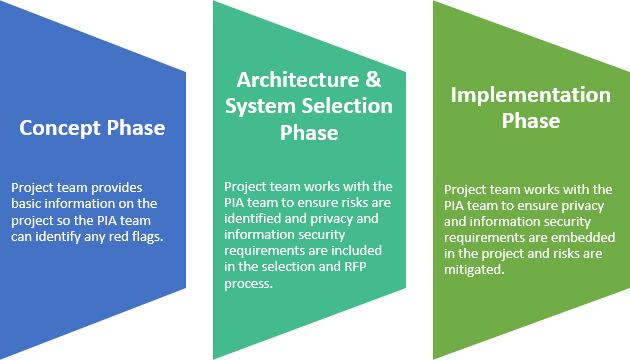 A PIA helps identify and build privacy and security requirements in advance thereby helping projects avoid costly program, service or process redesign and minimize exposure to potential privacy or security breaches. Where do I go for more information about privacy or security?